The Story: A group of friends who meet regularly for game nights find themselves trying to solve a murder mystery. So yeah, this is an easy one. Go watch this movie. It's super fun. Jason Bateman has been one of my favorite comedic actors for quite a while now and he shows no signs of slowing down. He has a very distinct manner and personality that is a perfect core to any comedy ensemble and he manages to make the outrageous seem perfectly believable. In supporting roles, Jesse Plemons and Billy Magnussen are super hilarious as two of the more interestingly odd characters in the movie. After the movie was over, my friend and I agreed that Rachel McAdams has to be one of the most likable people in Hollywood. It's super cool that she can handle just about any genre she takes on but her work in this movie was especially impressive. Her personality matched up perfectly with Bateman, they are husband and wife in the movie, yet she also stood on her own with some of the funniest scenes in the entire film. There are tons of twists and turns in the story to go along with heavy doses of physical comedy and there's also some really weird stuff thrown in as well but all of it is played for laughs. One of the things I'm always afraid of with outlandish comedies like this is whether or not the film makers will let things go a little too far with super over the top gags but, fortunately, there are no such issues with this movie. It is just enough to keep you entertained while minimizing any groans or letdowns which was made for a really fun ride. 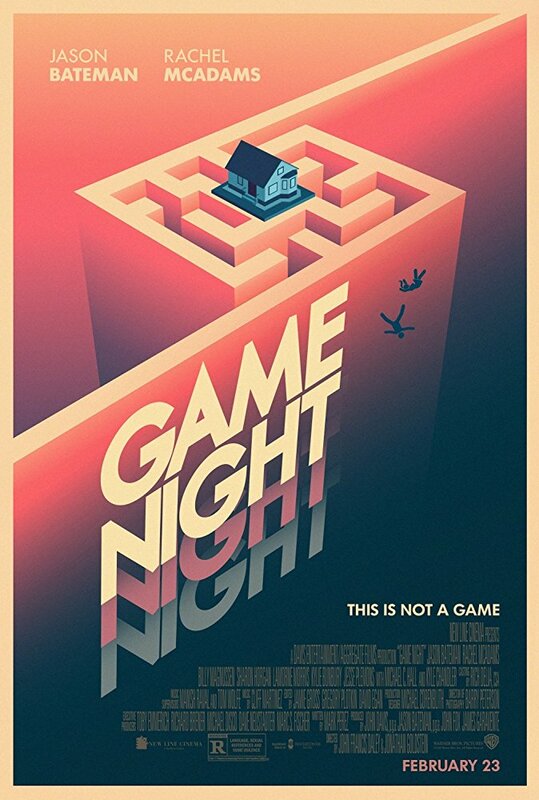 Game Night is exactly what you want it to be. Fun, hilarious, fast paced, and highly entertaining. I wouldn't say it's a must see in the theaters as there are no big special effects or epic action sequences but it is definitely a movie you;ll want to check out.